The research team has undertaken much research into the history of the Museum up to 1945. The Museum has published some general information about its history in its 'Souvenir Guide' (for sale in the Museum shop) but the attached timeline of key activities and events in the Museum up to 2006 may prove interesting. The main (but not only) source of information for this timeline has been the published Annual Reports of the Museum, available since 1888. For this reason the content is somewhat arbitary, varying at times from the trivial (the presentation and display of photographs of the donor of the founding collection) to the substantial (successful applications for large museum-changing grants etc). 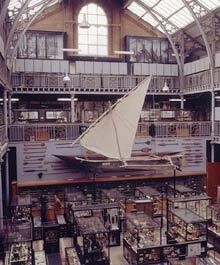 In particular, paid staff in the Museum were few in number during the early years and are thus recorded in some detail whilst in more recent years the number of staff has risen substantially, as the Museum has been increasingly successful in grant applications, and staff reporting has shrunk accordingly.